Traveling can complicate your normal workout routine, especially if you travel by plane. Discover how flying can wreak havoc on your next workout and what to do about it. It's early in the morning. You're half-awake, dehydrated, hungry, and crammed in a tiny seat alongside two snoring strangers. Adding to your morning misery is major turbulence and a crying baby two rows back. This probably isn't the pre-workout routine you had in mind. If you don't properly prepare, flying can take a toll on your upcoming workout. 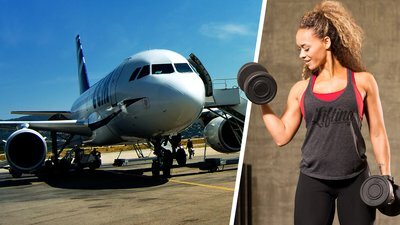 Learn how traveling by plane can affect your nutrition and mobility, and properly prepare to conquer your next workout! Because altitude increases the amount of moisture lost via your skin, flying 34,000 feet in the air can lead to dehydration. So, you should drink more—but no one wants to be that person bugging their seat mates to get up so they can use that little lavatory. And if you don't bring your own water bottle, well, you're stuck with an infant-size portion that requires a 30-minute (or more) wait for a refill. Bring your own bottle to the airport. After you pass through security, fill it up at a water station before boarding the plane. Consider grabbing a low-calorie or calorie-free sports drink, too, to reap the hydration benefits of added electrolytes. Additionally, don't be afraid to use the bathroom. If you have the option, select an aisle seat for easier access to the restroom. The type and amount of food you can bring with you to the airport depends largely on the mood of the TSA agent and the person working the x-ray machine. Liquids are a no-go unless the packaging is small enough to pass muster. Depending on the airport, protein powder, sandwiches, and bars might be no problem, or they might trigger a search. Seriously, it happens. In most instances, the hassle isn't worth it. But if you don't bring your own food, you're stuck with unhealthy, overpriced airport fare. First, know the rules. The maximum amount of a liquid you can bring is 3.4 ounces (100 milliliters). The TSA considers the following items liquids, by the way: creamy dips and spreads, jellies, sauces, nut butters, salad dressings, soups, hummus, fruit cups, and yogurt. In most instances, you'll be fine with protein powder. I recommend rationing what you'll need into Ziploc bags. Label each bag with "whey protein" if you feel the need, especially if you're using a vanilla protein powder. Additionally, consider bringing prepackaged snacks such as jerky or protein bars. Fresh fruit is another good option. Depending on the length of your flight, the cramped seating may leave your muscles tight when you deplane. And if you're tired and trying to sleep on the flight, you're bound to fold yourself into some unnatural position. If you are able to fall asleep in said position, any type of back or overhead-loaded exercise should be avoided if training later that day. Make mobility a priority before your next workout. Overlooking this detail could lead to serious injury. Consider investing in a travel-size foam roller and prioritizing a stretch-and-roll session shortly after landing, if your schedule permits. Depending on your departure time, flight length, and schedule for the day, consider taking the day off—it won't kill you. Rushing into the gym tight and dehydrated isn't a recipe for a good workout; it's a recipe for an injury.